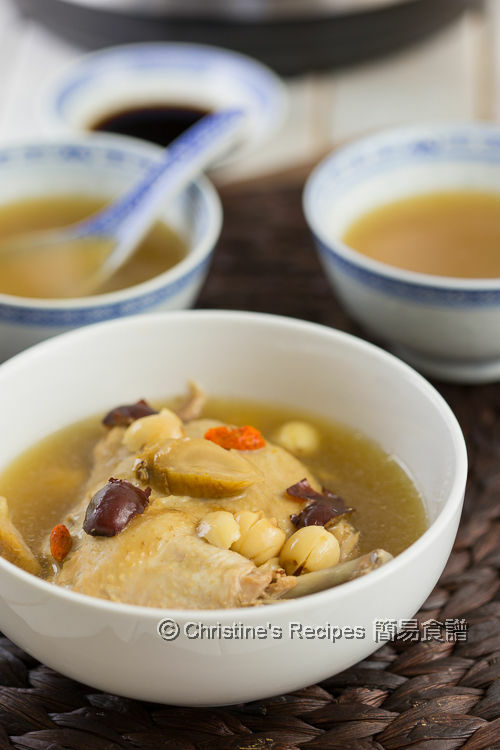 This Ginseng Goji Chicken Soup (花旗參杞子雞湯) is one of my favourite traditional Chinese ones that I enjoyed so much throughout the year. The soup is commonly simmered for long hours to intensify the flavours. The ginseng has lots of health benefits. Study shows that ginseng can help to boost our immune system and lower blood sugar levels. Ginseng tastes a subtle bitterness, striking a balance of the sweetness of goji berries and candied dates in the soup. After seasoning with a bit of sea salt, this chicken soup tastes so good. I love using whole dried ginseng because their flavours and smell can be kept for a longer time. For making soups, it’s better to cut ginseng into smaller pieces, then you can speed up the cooking time. However, the texture of dried ginseng root is quite tough and difficult to chop into pieces. Lucky me, I learnt a trick from my mother-in-law. Simply steam them until soft to cut. If using fresh ginseng, it won’t be a problem. 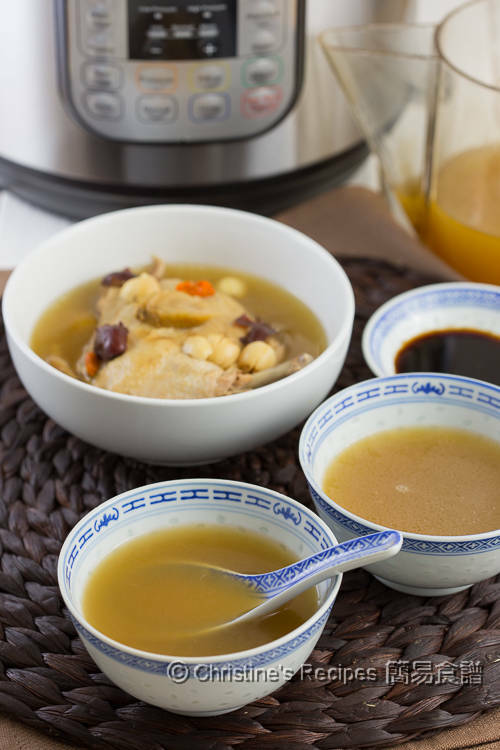 I tested making this traditionally long-simmered ginseng chicken soup with my Instant Pot, electric pressure cooker. Not surprisingly, it helps to cut down the cooking time a lot. Save time, save energy, and in other words, save money. The taste of this soup is so intense with extraordinarily satisfied results. Yet, without a pressure cooker, you still can enjoy this delicious soup. Simply cook it on a stove top. It tastes equally good, only with longer simmering time. Dried ginseng is quite sturdy and hard. Steam for 10 minutes, or until soft to cut. Rinse and drain all other ingredients. Set aside. Rinse the chicken and cut into 2 to 3 large chunks. Blanch in boiling water to remove the blood and impurities. Rinse and drain well. 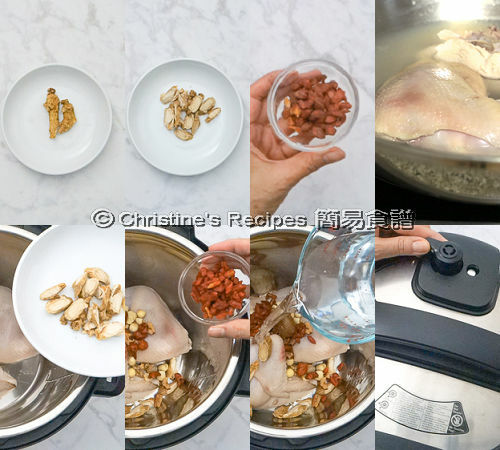 Put the chicken chunks and all other ingredients into Instant Pot, ginseng, ginger, goji, lotus seeds and candied dates. Pour in the water. Close the lid with steam release handle pointed to “Sealing”. Select “Soup”, high pressure cooking for 35 minutes. Press “Cancel”, quick release. Remove the lid. Press “Saute”, and cook for 10 minutes. Season with salt. Serve hot. Put all the ingredients in a large pot. Pour in 6 to 6½ cups of water. Bring it to boil over high heat. Then reduce heat to medium-low and simmer to 2 to 2½ hours. Season with salt. Serve hot. You might like to remove the chicken skin before cooking. The soup will be less greasy. I used a oil filter that looks like this fat separator on Amazon. It’s very handy to filter out the oil on soup or sauce surface. American ginseng is available at Asian grocers or Chinese herbal medicine stores. You might ask the staff at Chinese herbal medicine shop to help to slice ginseng. Or simply buy the already sliced ones. Very nutritious and tasty! It's one of my favourites too. This is the link to order the fat separator on Amazon. Made this soup tonight in the Instant Pot and it was great! Didn't even need salt, the soup had great flavor already. Thanks so much for this! Glad that you liked this recipe. Yeah, this soup is paced with flavours.